Think back to those times where you had all of your merchandise ready to check out, only to find that there's a significant shipping cost on top of your total. Isn't this such a drag? Now, you can avoid this situation. 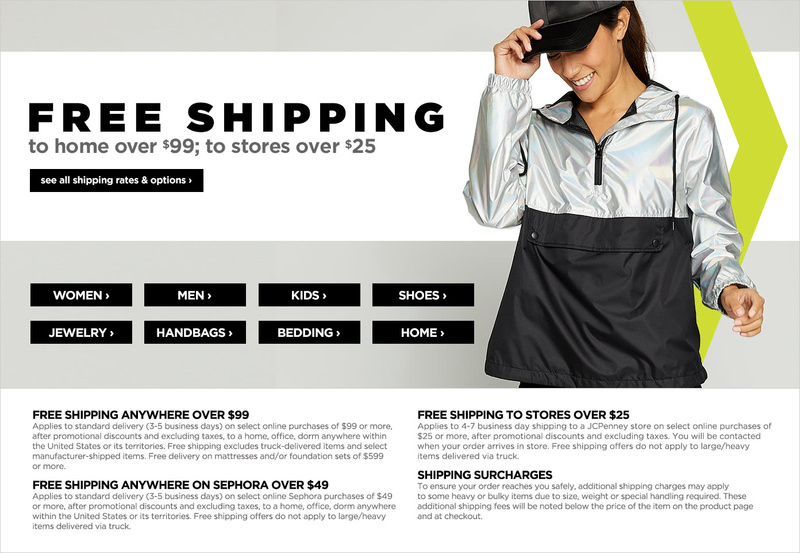 Here at JCPenney, we offer free shipping to let you enjoy a smooth, hassle-free online shopping experience! There are a great many things in life that make us shappy, and netting free shipping with your purchase is most definitely one of them! Shop to your heart's content. With our extensive home, apparel and jewelry collections, you're sure to find something that suits you perfectly. Handsome clothing for men as well as cute women's clothing are must-haves for any season and are available for free shipping. Shop dazzling jewelry and top-quality watches to complement your new wardrobe. There are deals to be had all year long!